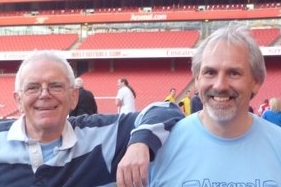 Statues are rather important to the AISA Arsenal History Society, not least because it was at a meeting that three members of AISA had with Ivan Gazidis in 2010 that we suggested the idea of statues around the stadium. (I also gave him a copy of the recently published “Making the Arsenal”). Mr Gazidis showed an immediate enthusiasm for the notion of the statues, and I was asked to write up a subsequent report on the topic, which I duly did. Later I was able to have further discussion on the topic with Mr Gazidis at one of the AISA AHS receptions at the House of Commons, and it was then that I learned that there were plans to expand on the original three statues. I fear my own notion of acknowledging some of the important founders of the club like Jack Humble and Lt Col Sir Henry Norris in statues is still a long way off, and I can understand that such distant figures don’t get the publicity that people like Bergkamp and Henry do gain. So, no complaints from this end although I’d still like to see something commemorating these men, one of these days. An “Arsenal’s Forgotten History” or maybe “Arsenal’s Forgotten Heroes” section perhaps. But I particularly have no complaints because Arsenal.com is showing a real solid interest in the work AISA Arsenal History Society is doing by reproducing (with our full permission I should add) some of the articles we have produced on specific issues in Arsenal’s history. Of course Arsenal.com is selective – for while the History Society is interested in discussing some of the less successful moments in our past as well as the positives, you wouldn’t expect the club’s site to want to dwell on these. That’s not their job. But they have recently re-run another one of our pieces… Arsenal’s great pre-Highbury rivals – our article on the way that the rivalry between Arsenal and Millwall developed in the late 19th century. So, many thanks to Arsenal.com for noticing us, and of course eternal thanks to Ivan Gazidis for taking up the idea of the statues, and not only putting up the first three, but also continuing with the theme today with statue number 4. Now… how what can we do to commemorate “Arsenal’s Forgotten History”?